Does your organization use Mercedes-Benz Sprinter vans? If so, Advantage Outfitters, LLC can provide add-on equipment that can help protect your staff and tools, increase convenience and access and maintain resale value. Our Sprinter ceiling liners, wall liners and ceiling panels help maintain the integrity of your vehicle’s interior and provide a thermal and sound barrier that can encourage efficient energy use. Advantage Outfitters, LLC can supply you with Sprinter van liners that will ensure a tight fit and years of reliable operation. If you’ve decided to buy wall liners for your van, there are certain things to look for in the product you buy to give you the results you desire. You want products that are durable and made of hard plastic that won’t bend or break easily if tools jangle against the liner regularly or heavy cargo bangs against it. You also want it to stand up to heat and cold. If introducing noise is a concern, you want a product that already comes with insulation. That way you pay one price rather than paying for someone to use foam to insulate the van and then buying a wall liner panel. If you’re going to install this yourself, you want something that’s easy to install and isn't going to take a lot of time. You want to it look good. You don’t want to pay good money for a product that doesn’t look as professional as you do. You wanted it to come in the right sizes for your wheelbase and your roof height. It’s great to find a wall liner that meets all the above requirements, but it’s no use to you if it doesn't fit your van. 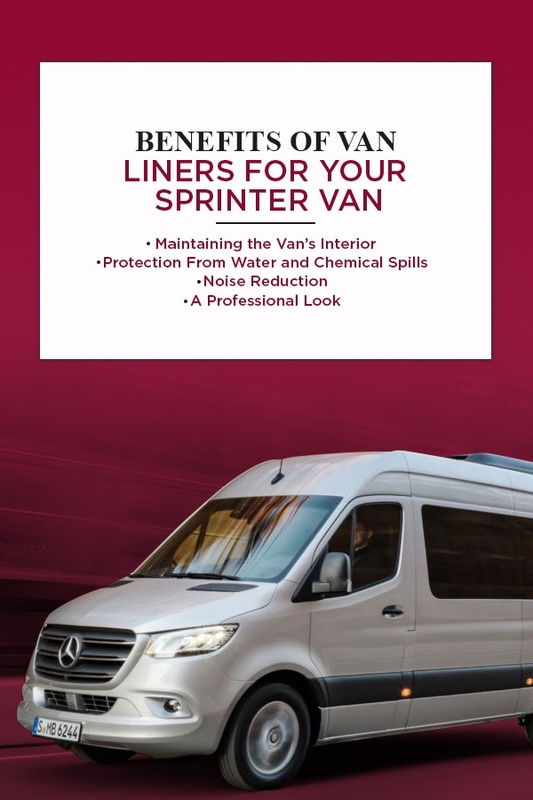 Although we’ve mentioned a few of the benefits of using wall liners on your Sprinter van, as the owner of a commercial business, such as a plumbing, heating or electrical repair company, the result could be more money saved and less money spent. Whether you’re an electrician on the way to a job or a plumber who received a midnight emergency call, you know how important it is to have the right tools in your van. One problem is, of course, vans walls are made of metal and so are many of your tools. If those tools get bounced around because your midnight emergency call is down a rural road or you have to hit the brakes suddenly, and your cargo goes flying, this can cause the interior of your van quite a bit of damage. A Mercedes Sprinter van is one of the top-of-the-line vans. They can cost more to buy, but they’re durable and hard-working. When the day comes that your van no longer suits your purposes and you want to sell it, you’ll get a much better sale price if you have protected your van interior walls with wall liners. Put yourself in the buyer's shoes. If you were going to buy a used van, which would you like to buy — a van with wall liners that have protected the interior walls or a van that looks beat up and unprofessional, with lots of dents? Condensation can be the bane of existence for a van owner or a company’s fleet of vans. This is particularly true if you sometimes experience harsh weather conditions in your region. Condensation can build up on the inside of the van which can lead to mold and other issues. Mold is dangerous for the van and unhealthy for your employees. It looks terrible and smells awful as well. Our Legend Fleet Insulated Duratherm wall liners have a layer of foil-backed foam insulation attached to the back of each wall liner panel. This reduces condensation and also makes the interior environment more comfortable for your employees. In the winter, it keeps cold out and heat in, while in summer, it keeps the heat out and the air conditioning in. Having to work all day in a noisy environment can be annoying and stressful as well as potentially dangerous and distracting. If your employee hears something bang off the side of the wall, they are more than likely to risk a look around to see what’s going on in the back of the van. And just like that, they have an accident, and your van is unusable and needs to go to the shop. Continuing to work in a van without wall liners can also create hearing problems for employees if they must drive eight or nine hours a day listening to the jangle from the back. Most of the noise in a van comes from the cargo area. A lot of it has to do with the way vans are built. Even a well-constructed van like a Mercedes Sprinter still has a lot of parts in the cargo area that makes a fair bit of noise. While liners help reduce that noise to a much more manageable level, you can reduce the noise even further if you combine wall liners with racks or storage areas for tools and necessary parts. It all starts with the wall liner. Wall liners give your van a professional look. This offers benefits in terms of potential resale value in the future but also in how your customers see your company. All of our Legend Fleet Insulated Duratherm 1/2-inch wall liners are precision cut to fit your van, which helps to give your van a more professional look than just the metal wall of the van if a customer happens to look inside. Things that seem inconsequential can actually make a big difference to earn repeat business and to gain recommendations from happy customers, including creating a professional appearance for the inside of your van. At Advantage Outfitters, LLC, we offer a selection of wall liners including insulated and uninsulated. Panels made of 1/2-inch of rigid, heavy-duty gray plastic, complete with insulation on the back designed to give your interior walls protection. All the pieces will be precision cut for the van. All of our Sprinter 144-inch wall liners are compatible with the Sprinter Worker van. They’ll arrive with pre-drilled holes and self-drilling screws to make self-installation a cinch. They’ll ensure an additional layer of protection to guard against nicks, scrapes and holes brought on by flying tools and unsecured cargo. Wall protection created by 3/16-inch rigid plastic. These panels are also precision cut to fit. Again, they are easy to install. What’s the difference between a Duratherm liner with insulation and the vanLiner paneling without? Both versions offer benefits. If saving costs is important to your business, then the vanLiner option is a good one for you. The vanLiner panels cost less than their insulated counterparts while still protecting the inside of your van. While the insulated Duratherm version offers better protection against water and condensation damage as well as better soundproofing, they are more expensive and add more weight to your van. So the choice is yours. Depending upon where you work, the kind of job that you do, the type of cargo that you haul or whether you are just starting out or have a long-established business, Advantage Outfitters has a wall liner option for you to protect the inside of your van. If you want to protect your walls from dents, nicks and scrapes, it makes sense that you also want to do the same for the ceiling of your van. Our Legend Fleet Insulated Duratherm 1/2-inch Ceiling/Roof Liner is similar to our DuraTherm wall liners, offering protection against moisture, insulation to ensure a more-friendly environment inside the van and sound deadening. Like our wall liners, they also come precision-cut to fit your van, and the panels fasten to the roof using pre-drilled holes and self-drilling screws. Our ceiling/roof liners offer the same professional appearance as our wall liners in and are incredibly easy to install. While protection for the walls and ceiling of your van is important, protection for your door panels may be a close second. Think about how you use your doors, constantly opening them to take tools and material in and out of your van. Depending on how heavy the cargo is or how many tools you have to use, it’s not unusual to bang the door when you’re removing them. Lots of potential dents and scratches there. Our Legend Fleet Insulated Duratherm 1/2-inch Door Panels have that same solid insulation and protection of all our Duratherm products. They’ll give your Mercedes Sprinter van the day-to-day protection it needs such as reducing condensation and deadening noise while also helping increase eventual resale value. If you looking for a more economical option, try our Sprinter vanLiner 3/16-inch Plastic Door Paneling. It will also give your doors the protection they need against dents and scratches. When you’re choosing to protect the inside of your van, whether it’s walls, roof or doors, it is critical you pay attention to the correct wheelbase and the height of the roof of the van. The size of your van and whether you have a high or low roof also determines the number of panels you receive. There are two panels for the rear door and two for sliding doors in a low roof Sprinter van. When you have a high roof van, you’ll have two panels for the rear doors and three for sliding doors. Likewise, you will receive more wall and roof panels if you have the larger 170-inch wheelbase than if you have the 144-inch van. You can find installation instructions for all wheelbases and roof sizes on our website. The instructions are easy to follow and will ensure you can install the panels quickly and efficiently. Our vanLiner products all offer the same attention to detail and precision fit whether you have the 144-inch or 170-inch wheelbase or a high or a low roof. Regardless of the size of your van, we have the product that will fulfill your need. As we noted above, protecting the inside of your van and ensuring a comfortable, safe ride for your employees can involve more than installing wall liners, roof liners and door panels. You want your employees to be able to work efficiently, to know where to find every tool and every small part they need and to stay organized with a place for everything and everything in its place. That’s why we also offer drawer systems, grills, bumpers, grill and bumper protection and more. We offer an abundance of discounts, promotional sales and clearance items sure to meet your company’s functional needs and budgetary limits. Our company is designed to provide you with the fit you need for your commercial vehicle, whether you are a tradesman or you haul cargo. We deal with all brands of vans. Our clients include utility companies, municipalities, contractors, leasing companies and companies who sell vans. We ship our products anywhere in the country, and we have numerous installation locations where you can bring your van to be outfitted. Our Sprinter ceiling panels, door panels and wall liners are available for purchase at our online store and will be shipped directly to your facility. We understand you need to get your cargo vans on the road quickly, so orders ship within 48 business hours of purchase. Feel free to contact us online or call us at 866-925-4844 should you have any questions. Our van organization specialists are ready and willing to provide additional information about our products.